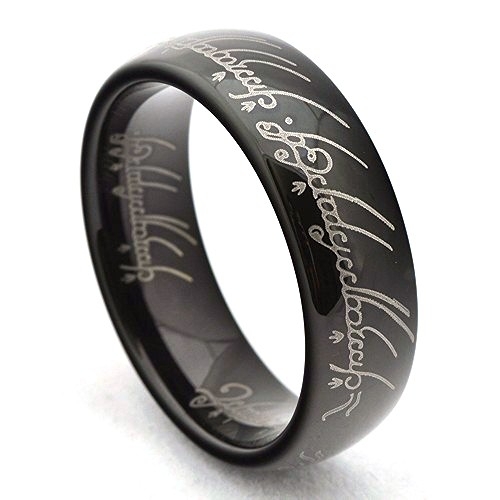 Tungsten Carbide Laser Engraved Elvish Lord of the Rings This black colored laser engraved tungsten ring features the engraving made wildly popular in The Lord of the Rings. The ring is a replica of the One Ring with precise laser engraving, which brings out the magnificent elvish inscription. "One Ring to rule them all, One Ring to find them" on the outside "One Ring to bring them all and in the darkness bind them." on the inside. This Tungsten ring will never tarnish, scratch or bend. It comes with free shipping and a black velvet box! Q: what is the writing on the ring? Was this answer helpful? 104 of 109 Customer(s) found this Answer helpful. Q: Is the ring comfort fit (inside round) or regular fit? A: I bought this ring as an anniversary gift for my husband, who happens to love all of the Lord of the Rings movies. This ring is extremely sleek and comfortable. He works with his hands for a living, and he is able to do a jobs work while never taking off his ring!! It is wonderful and beautiful to look at. Q: What language is it on the ring and its meaning? A: This ring comes in Black, Gold and Silver. Hope this helps! Q: Hello, just wondering if the ring already comes with the inscription on it (as in the picture) or do I have to fill in the engraving section? Q: what does the writing on the Black "Lord of the Rings" ring say? This is the ring my fiancé chose for our wedding, being a huge LOTR fan. It fits wonderfully and has smooth edges. Definitely would buy from again! Great ring! We love it! My husband found this ring on your site while looking for a heavier duty wedding band to replace his beat-up silver band. He's always been a huge Tolkien fan so he was immediately sold. We ordered matching bands as we had always planned to upgrade to something more unique and fitting to us as a couple. This ring definitely fit the bill and is gorgeous! Looks and feels great and we'very received many compliments on them. The ring looks fantastic and has a nice, weighted feel to it. Been holding up great to a little abuse as I adjust to having one on. Not a scratch so far. Would recommend to anyone looking for a little extra style. The ring has good weight and feels greet when worn. To say that it will never scratch, is a bit of a stretch. after just a few days I began to notice scratches and nicks in the black coating. I'm not a jewelry wearer, but I am a LOTR fan. Bought the ring on a lark. Love it so much that I just ordered the silver version. As for TungstenFashions, I give the company a perfect 10/10. If only all businesses were as good. I recently ordered this ring and it was the wrong size. The return process was so easy and in a few short days I got the right size back. I love this ring. 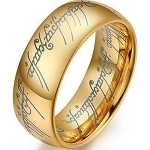 It looks beautiful and if you are a Lord of the Ring fan you need to have this ring. Great purchase. Really enjoy this ring. Impressive look without being flashy or trashy. Great weight. Goes with any assemble for any occasion. So far I am very pleased with this ring. It looks great, fits great, and has held up well with everyday use. I've only had the ring for a couple of weeks now, so I cannot speak for its extended durability, but so far so good. I would definitely recommend this ring to any LOTR fan. My ring looks even better than from the website picture. Love it! I love this ring. I had ordered the same ring in the gold color last year, put it on the day I received it and haven't taken it off at all. It still looks like I just took it out of the box. Saw the ring in black and had to have it too. It's beautiful. A substantial ring, heavy without being too heavy. Nice edge, not sharp at all. I just can't say how much I love this ring. The ring felt heavy and smooth and fit really well on my finger. I purchased the Lord of the Rings ring in black for my husband. The ring is beautiful and very well made. My husband was surprised by the high quality for the low price. I'd recommend this company. This black ring with silver characters is a great take on the LOTR one. I was worried because the writing on the picture looks not very smooth but it actually looks a lot better. I think it looks great and I wear it every day. It also has the writing on the inside. The font of the writing is a bit different than in LOTR but it is very close, only a real expert would realize the difference. The ring I first ordered came quickly was exactly as I wanted and as described - but was a little too big. I took advantage of the fee exchange policy and got the right size back quickly, with no problems at all. Highly recommended. My ring finger is varied in size between a 9.5 to 10 due to humidity. With the high quality and low price, you can't find better. I ordered both size rings and instead of sending one back I just kept both of them. I bought the black tungsten LOTR ring for my husband's birthday although he does not usually wear jewelry. He has not taken this ring off since he got it, he absolutely loves it! So do I...I am wearing the LOTR gold tungsten ring!